PDF 1: Eight 2-Panel Solid Pages to print on the back of the Journal Image Pages, if desired. They measure slightly larger than the Journal Image Pages to avoid white edges when printing double-sided. Each Solid Page is accented with elements found on the Journal Image Pages. Also included in this PDF is a unique Cover Page for your journal or mini album. PDF 2: Two Envelopes with 2-Panel Note Cards match the featured designer pages in the "Feathers and Friends" Printable Journal Kit. Each envelope is one piece and, when folded, measure approximately 4-3/8” x 2-7/8”. The extra-long flap closure is designed to finish off your envelopes by folding over to hide metal prongs and button stitching on the inside or to use your favorite border punch. The 2-panel note cards, when folded, measure 4-1/4” x 2-3/4”. The vintage color is ideal for creating your own design on the note cards with heat-embossing, stamping, mixed media and other favorite techniques. 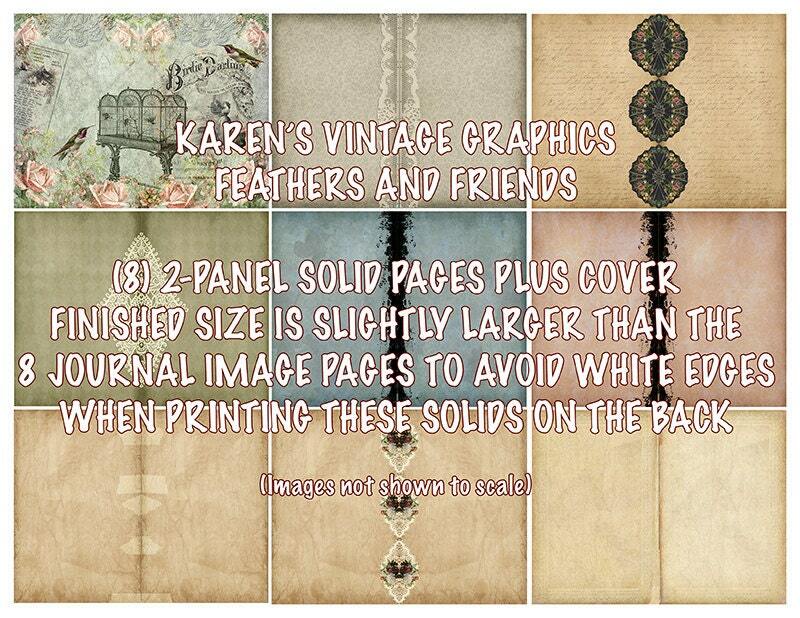 Print the full-size vintage page on the back of this set for a finished look. PDF 3: The “Script” Double Pocket w/ two 2-Panel Tags is a perfect addition to the “Feathers and Friends” Printable Journal Kit. The double pocket prints as one piece and folds together, creating a top-loading and shorter front pocket, measuring approximately 3-1/8” x 5”. Two 2-panel tags also are included in the set. The taller tag fits into the top-loading pocket and measures about 2-7/8” x 5-1/2” folded. The shorter tag measures about 2-7/8” x 4” finished. Glue the two panels closed to create front-and-back tags or simply fold to create journaling tags. Embellish as desired. 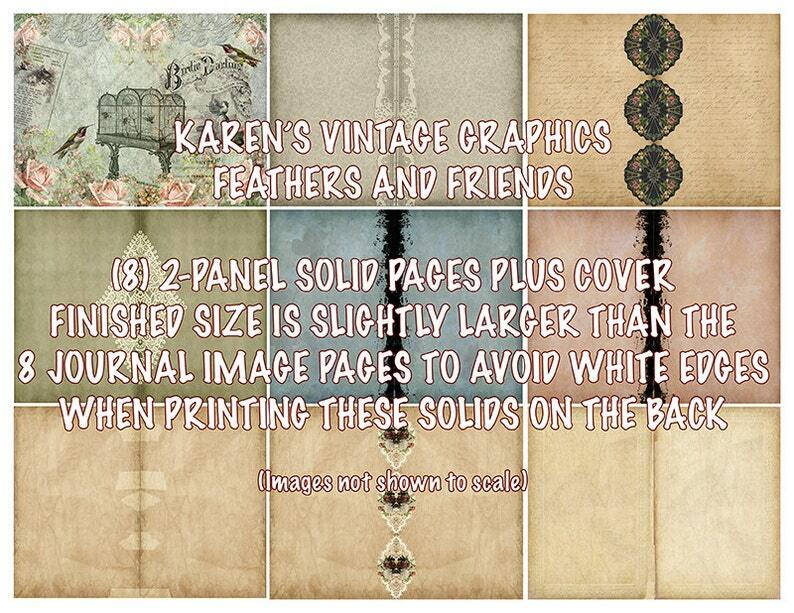 PDF 4: Fill your “Feathers and Friends” Printable Journal Kit with 13 timeless vintage art images of various sizes. Each image was chosen to complement the journal with nostalgia in mind. Slip them into page pockets or use them as tuck spots to accent your journal or mini album. They are ideal for heat embossing, stamping and mixed media. Beautiful - thank you so much!